Greetings everyone! 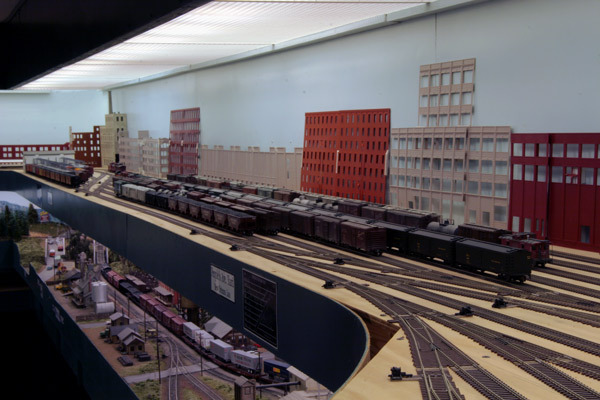 I wanted to begin a new thread which will follow the completion of my People�s Avenue Yard on the New Orleans level of my MA&G. The track work has been complete on the layout for a few years now, so what remains to be done are structures, scenery and details. In late April of 2010 I was still working on my Gibbons Feed Mill seen in the last link. 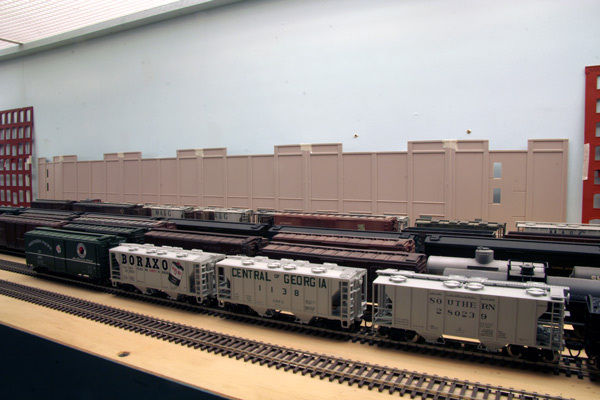 I shifted my efforts to preparing for my clinic at the SER/NMRA convention in May. 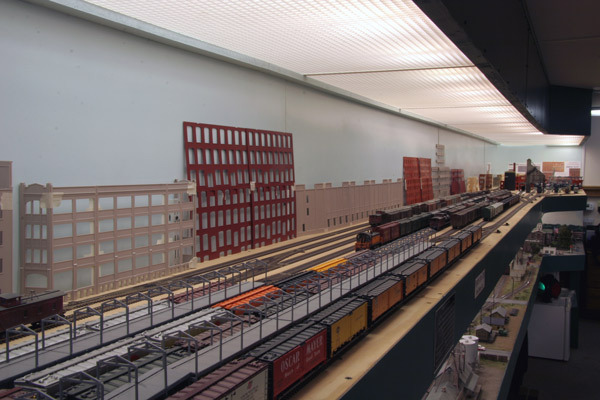 After the convention, my interest waned and I rarely even opened the door to the train building at all � until a few weeks ago. 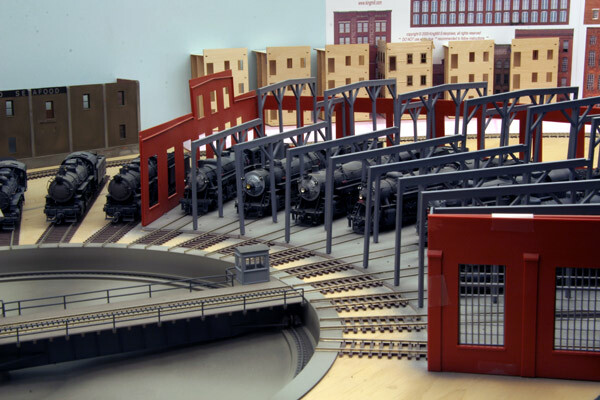 After an eight-month hiatus from model railroading, I�m finally back at the workbench. 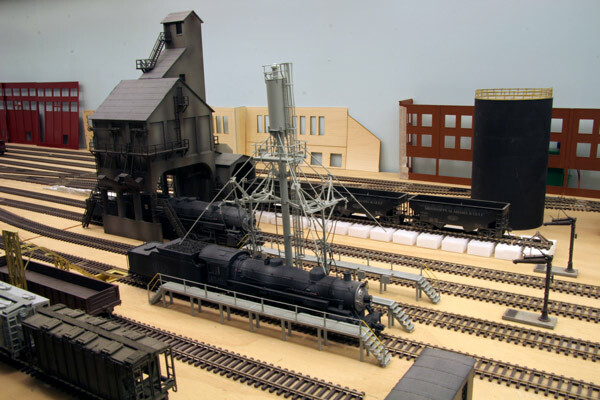 After much consideration, I have decided to leave the feed mill as-is for now and focus on the freight yard section instead. I hope you will come along for the ride! Here are some overall views of the yard in its current state. All of the structures are simply taped together to give a visual sense of how the completed scene will look. For this first installment, I would like to give a quick overview of the various builds that will be included in this project. Starting with the far west end of the yard are these structures. In the foreground will be a large icing platform serving four tracks. 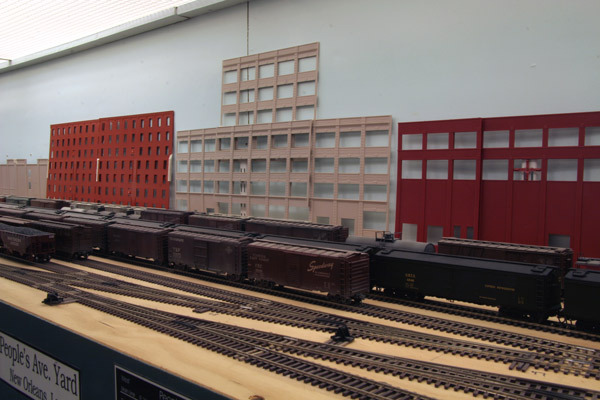 The background buildings are (L to R) a Bachmann Ambassador Hotel, a DPM modular build from my previous layout, and 2 Walthers River City Textiles kits. The next two flats will be the MA&G Corporate Office building (Walthers American Hardware Supply), and a large, yet-to-be-named industry made from 4 Walthers Fireproof Storage kits. 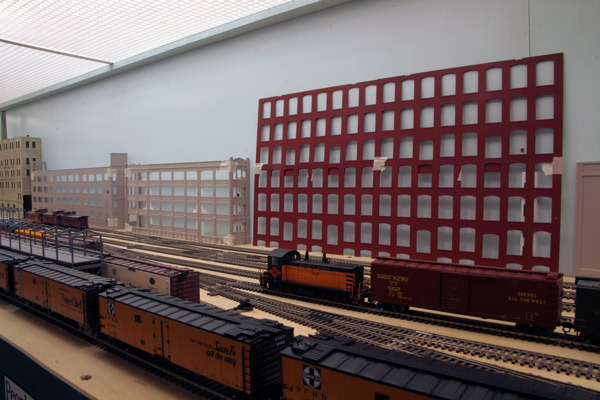 Next will be a large cold storage warehouse made from 2 Walthers R.J. Frost Ice & Storage kits. 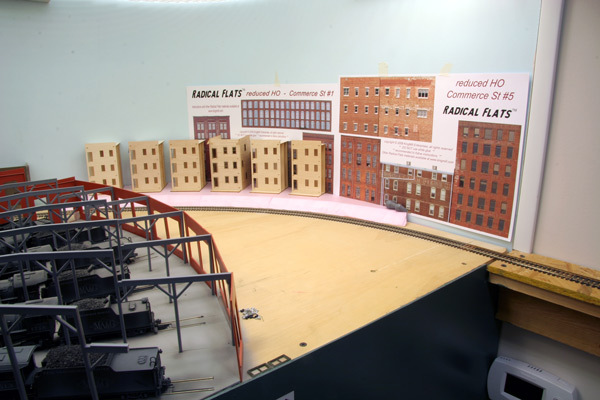 The next three flats will be built from (L to R) 2 Atlas Middlesex Manufacturing kits, 2 Walthers Hardwood Furniture kits (this one will come out over the track) and a Walthers Champion Packing Company. 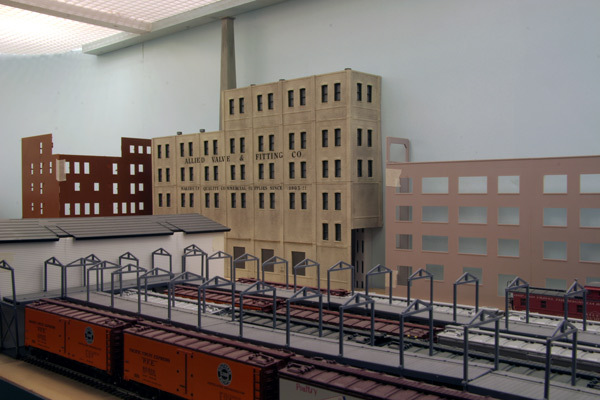 As we get closer to the engine servicing facilities, there will be a large wooden structure kitbashed from a Blair Line Warehouse Backdrop Building and a Model Tech Studios Seeley Manufacturing. I�m really looking forward to this one! 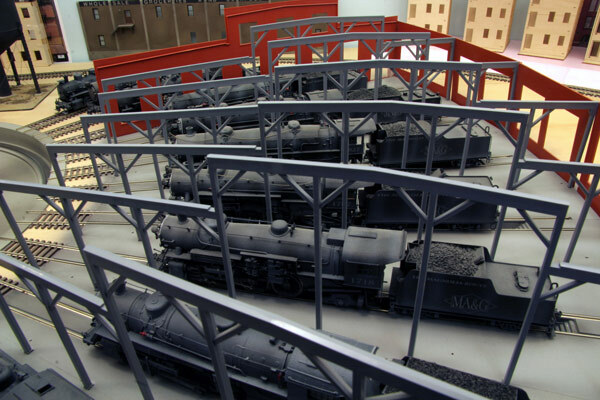 Here is a first glimpse of the east end of the yard which includes the servicing area. The next backdrop building will be made from Walthers Commissary Buildings (several more stories will be added). 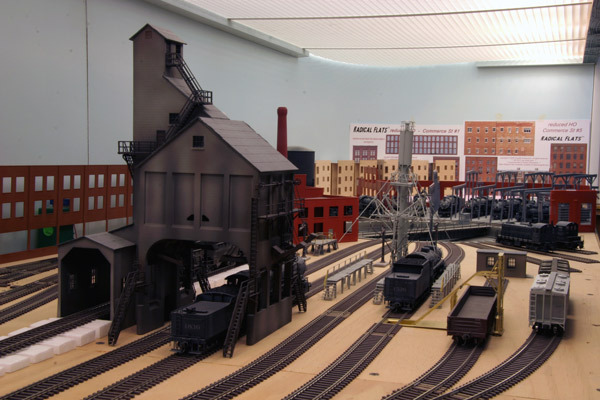 The coaling tower is the only structure that is completely finished. It is also a Walthers kit which I detailed heavily. The sanding facility is a brass model by Overland. After removing the base, it suffered some damage which will eventually be repaired. For now, it is simply in place for effect. The cinder hoist is also a brass model from Overland. Here is the turntable area. 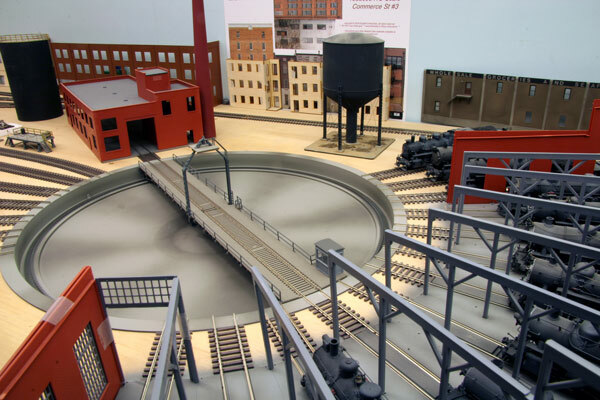 As with most all of the components of this project, the turntable, machine shop and roundhouse are all from Walthers. The water tank is by Tichy and needs only an MA&G logo to be complete. In the background are the first of two sets of tenement buildings. These three are from Model Tech Studios. 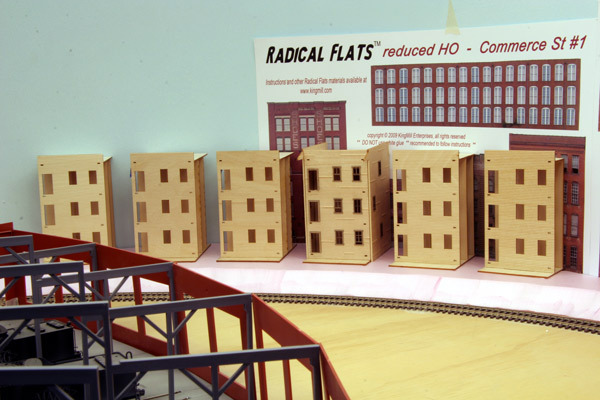 The paper backdrop buildings are from the incredible Radical Flats collection made by King Mill. I received the entire set for Christmas and will use them extensively throughout the yard area. They have yet to be cut and permanently mounted. Even so, the effect is already very nice. I am modeling the roundhouse open to the edge of the benchwork to allow open viewing of the detailed and lighted interior. The plastic trusses of the Walthers kit will receive major modifications. 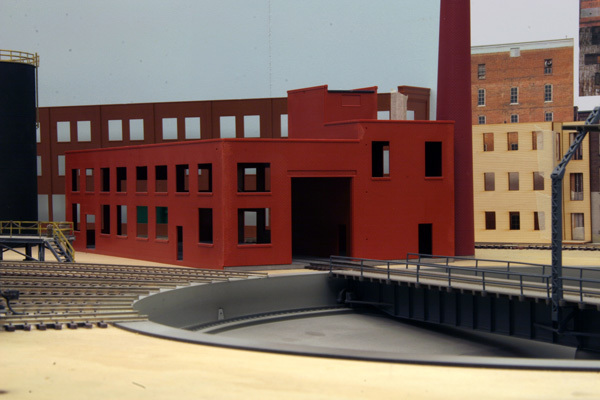 The roundhouse will be the most detailed and time-consuming part of the entire project. The brown background building in the first photo will be made from parts of a Walthers Golden Valley Canning kit. 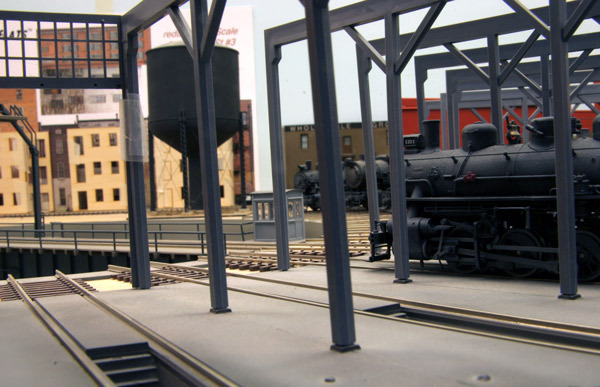 In the open area behind the roundhouse will be an assortment of junk and maybe a crane on a non-operating spur track. 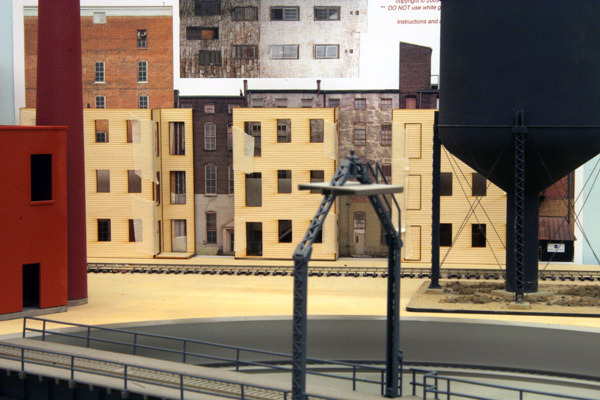 Along the backdrop are six Northeastern Scale Smallshaw Tenement Row buildings. These structures will begin this project. 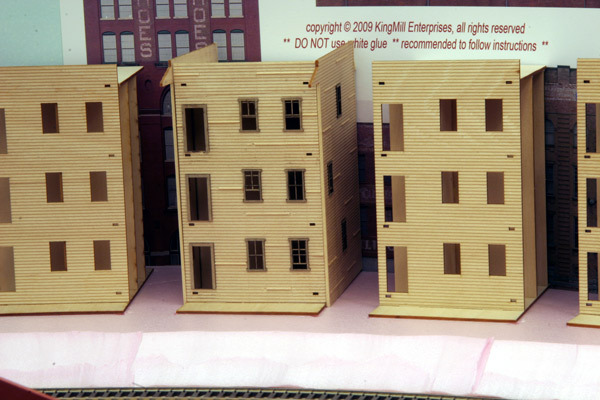 I have already trimmed the base and interiors of three of the tenements to fit the curvature of the backdrop. More KingMill backdrop sheets have been taped up for consideration. The tenements will be mounted on the piece of pink foam seen here so that the entire scene can be built and detailed at the workbench. I have already carved the embankment. A lean-to fence will run along the top of the embankment. Thus far I have detailed the walls of one of the tenements with nail holes and lifted clapboards. The windows and doors have been installed as well. Once all six structures reach this stage of completion, I will paint them all at the same time. A basic white-wash color will be applied in keeping with the fifties era. I know this was a long introduction, but you can see how much there is to accomplish. This includes ballasting - which is something that I dread like a root canal! I would like to have the entire yard completed by the end of May. 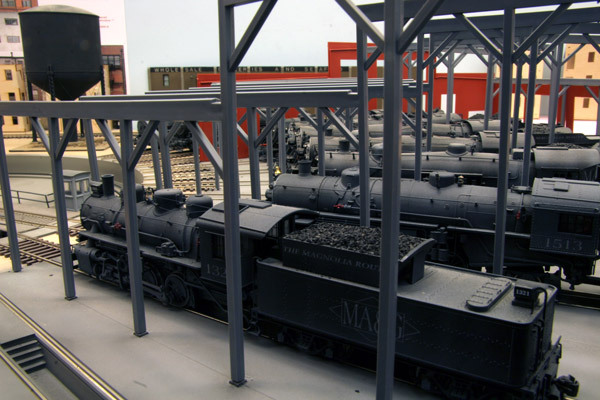 This is mainly due to the fact that Allen Keller is scheduled to come in October to film a MA&G Part 2 DVD in his Great Model Railroads series. I need to have the entire layout finished before then. Talk about an incentive!! Next time I�ll have more progress to show with the tenement area. Please stay tuned!! To quote George Costanza, "I'm Back, Baby!!!". It's great to have you back, baby! All i can say is WOW lots of work ahead. I like the way everything is laid out. Great scene. I�m looking forward to following your progress on the yard. Well that will keep the LP's employed for quite some time. Appears to be a nice addition ahead of you there Cliff. Is your icing platform primarily for Port of New Orleans and other local originations? It seems to me that the MP and SP would have short-hauled themselves if they routed Texas produce via New Orleans rather than Kansas City or St. Louis. It's great to see you back Cliff. I like how the tenement scene could come together. Thanks everyone for the warm welcome back. I'm really anxious to roll up my sleeves and get busy! James, the icing platforms are primarily for the exclusive use of the MA&G - particularly the northbound hotshot perishable consists. However, to add some operational interest, an occasional loaded reefer or two from the REA will be spotted for servicing. Truthfully, justifying the plausibility of an icing platform took a backseat to simply wanting to have one. They are just so darn cool looking. I think I purchased at least six of the Walthers kits as a starting point. I also looked at the Tichy kits, but the price for the number needed was prohibitive. This is one of the builds that I look the most forward to. I hope when finished it won't be recognizable as the Walthers kit. Thanks for your question! Good to see you back at it Cliff! It's great to have you back Cliff! I always enjoy your threads, and this one looks exciting. I can't wait to see the transformation and what you do with some of those backround buildings. 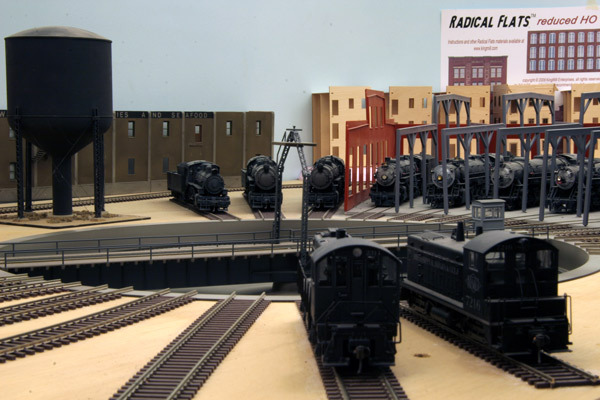 I will be entering the same stage on parts of my layout soon so I can't wait to steal some of your ideas! Having all of that work accomplished by May is a major undertaking. Seeing your progress in the past, it wouldn't surprise me that you might pull it off, but I hope you don't burn yourself out in the process. 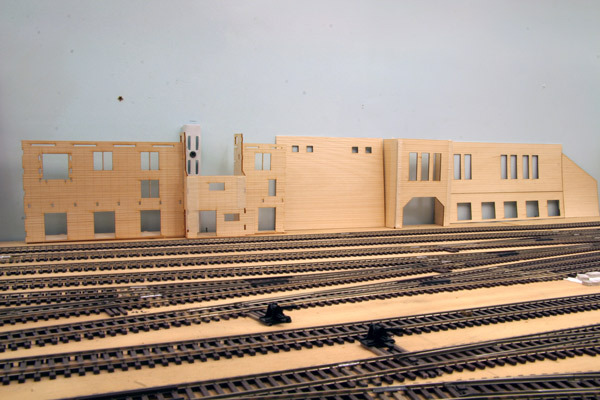 While I can appreciate that with Allen Keller coming to video the layout, you want it 'finished', I also know from following your work that there is already more detailed scenes on your layout than most, and your scenes are so well done (as your own videos show) that an hours worth of taping could be done on the lower level alone! Not to mention, many people such as your followers here on RRL enjoy seeing a 'work in progress'. So the message is, go for it, have some fun, but don't push yourself to the point of burn out! We enjoy having you here on the forum and miss you when you disappear for a while. Can't wait to see this scene develop! Your threads are the best!! I love your modeling work and skills. The only downside is that it magnifies my lack of it!! But that's okay, it just gives me something to shoot for. Can't wait for the update photos as you proceed. Looks like I'm going to have to buy a couple of Keller's DVD in the near future! Welcome home! I've missed the development threads for the MA&G! Between you and Andy, I manage to learn a whole bunch about what I'm not doing "right!" Oh, to have space, time and talent! Keep the posts and the pix coming! ...Please!!! This looks like it will be another great thread to follow along. I like the concept so far and am looking forward in watching you develop the area.